This article first appeared in Personal Wealth, The Edge Malaysia Weekly, on January 7, 2019 - January 13, 2019. Malaysia’s capital markets can expect to see robust deal flows this year, driven primarily by several key initial public offerings (IPOs), mergers and acquisitions (M&A) and various privatisation exercises, according to Baker McKenzie’s Global Transactions Forecast 2019. The report, which was published last month, anticipates that the deal pipeline in the country will be bouyed by a stable GDP growth of 4% to 4.5%, modest increases in interest rates as well as a range of business-friendly policy measures. These measures, which include corporate tax cuts and the national Industry 4.0 framework, could help drive significant deal flows in Malaysia. Despite market observers suggesting a challenging year ahead for the local economy, Wong and Partners’ corporate, commercial and securities practice partner Munir Abdul Aziz tells Personal Wealth that there is pent-up demand from shareholders to realise returns this year. “One can never be completely divorced from economic development of course, but the market tends to have a life of its own,” he points out. Kuala Lumpur law firm Wong and Partners is a member firm of Baker McKenzie International. The report, based on the forecast macroeconomic indicators of research firm Oxford Economics, projects 2019 to be a year of two halves. Several major transactions that were announced last year could be completed by the first half of the year. Thus, there could be a big increase in IPO activity (estimated at US$1.72 billion) in Malaysia, up from last year’s very modest US$100 million. “There was a lot of speculation last year that Axiata Group’s tower unit edotco Group Sdn Bhd would list, but it did not. Another notable IPO that did not materialise was that of Bank Islam Brunei Darussalam. It remains uncertain whether these companies will list in 2019 or later,” says Munir. Malaysian poultry group Leong Hup International Sdn Bhd was also poised for a 2018 listing. However, the IPO was postponed due to the death of its founder and executive chairman Datuk Lau Bong Wong in late August. It was reported that the company was looking to raise as much as US$600 million (RM2.51 billion) through the exercise. “Leong Hup is definitely on track for a listing in the first quarter of 2019,” says Munir. Meanwhile, Rampai-Niaga Sdn Bhd — the Malaysian franchisee of the popular British skincare and cosmetics brand The Body Shop — is looking at a RM200 million IPO, possibly scheduled for the second quarter of this year. IPO markets across the globe weakened last year, with a total deal value of US$151 billion, down from US$177 billion in 2017. However, a number of flagship issuances are expected to come to market this year. So, while the cooling equities cycle will constrain activity, Baker McKenzie forecasts an uptick to US$164 billion. In Asia-Pacific last year, Hong Kong continued to lead the way with IPO proceeds of more than US$35 billion. But other markets are quickly gaining ground. One standout performer in this respect was Vietnam, where the listings of Vietnam Technological and Commercial Joint Stock Bank and property developer Vinhomes helped push IPO proceeds to an impressive US$2.3 billion. India’s market was also lively, raising US$6 billion in domestic issuances. China’s IPO activity last year was far weaker than in 2017 despite several major technology firms going public and with more expected to list in 2019. As recent emerging market volatility eases, Asia-Pacific IPOs are expected to hit US$60 billion this before cooling in 2020, says the report. Overall, global equity markets experienced unexpected volatility throughout 2018, but recovered most of their losses in the final months of the year. The fundamental drivers of equity valuations remained favourable, according to the report. Corporates continue to reap the rewards of strong growth while markets remain buoyed by the liquidity provided by central bank asset purchases and low borrowing costs, as well as the impact on company valuations by corporate tax reforms in various parts of the world (notably, from the US). This has boosted listed firms’ ability to issue equity and finance further acquisitions. Thus, some of this momentum is expected to persist in the first half of 2019. However, with the US Federal Reserve accelerating its asset sales this year and the European Central Bank stopping its asset purchases at the end of 2018, some of the tailwinds behind equities will turn into headwinds for the next couple of years, 2020 in particular. 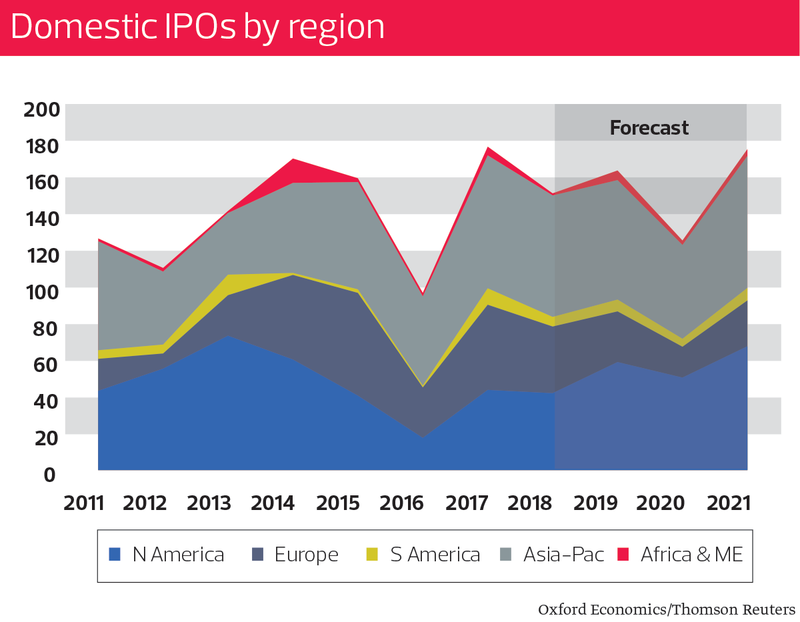 During this period, IPOs are expected to take a temporary pause as potential issuers wait for the adjustment in equity markets to run its course. From 2021 onwards, more sustainable equity price growth is projected, which supports an upturn in dealmaking. Unlike the soft IPO performance, M&A fared better in Malaysia last year. Two megadeals in excess of US$1.5 billion were completed, along with nine significant deals of between US$200 million and US$600 million. The two largest transactions last year came out of the healthcare sector. The first was IHH Healthcare Bhd’s purchase of a 30% stake in Turkish hospital operator Acibadem Saglik Yatirimlari Holding AS in October. The second was the late November acquisition of a 16% stake in IHH Healthcare by Mitsui & Co Ltd from Khazanah Nasional Bhd. The Baker McKenzie report forecasts that Malaysia’s total M&A activity will reach US$12.2 billion in 2019, on the back of an estimated 292 deals. This represents a drop from US$13.2 billion and 311 deals in 2018. “These numbers reflect the cautiously optimistic attitude of the market, based on the new government’s policy of balancing the need to firmly address the country’s fiscal deficit while ensuring market-friendly initiatives that support growth,” Munir said in a media statement earlier. “We expect activity in 2019 to take the form of divestments of certain strategic assets by the sovereign wealth fund, continued private equity investments and exits, including those driven by foreign private equity sponsors. There could also be greater deal-making activity driven by the new government’s intent to create a more competitive market environment for hitherto sheltered sectors such as energy, media and telecommunications. Also expect some degree of reorganisation of large conglomerates, including potential spin-offs or demergers,” he added. The report forecasts total M&A activity in Asia-Pacific to rise to US$751 billion this year. Activity in the region appears stable, with most emerging economies in the region better insulated against the Fed’s rate hikes than in the past. That said, the region remains vulnerable to fallout from the US-China trade war. Japan is projected to enjoy an economic rebound next year while Australia is expected to enjoy robust growth. M&A activity in Vietnam and India will benefit from policy reforms in those countres, making inbound investments more attractive. Last year was an exceptional one for India in particular, with roughly US$80 billion worth of M&A activity taking place in the country. In China, heavy industry consolidation and upgrading of the country’s manufacturing capabilities will be key drivers of M&A activity in 2019 and beyond. However, with the Chinese government’s ongoing financial deleveraging agenda (which impacts access to finance), overall M&A values are expected to take a hit. Consumer-facing sectors enjoyed a strong year of M&A activity last year, with a 25% acceleration in values from 2017. Megadeals — such as the EssilorLuxottica tie-up at end-2018 — played a role, but buoyant consumer markets around the world also supported dealmaking. The megadeal, which was formalised in October last year, saw the world’s largest lens maker, French outfit Essilor, merge with the world’s largest frame manufacturer, Italian giant Luxottica. Following the merger, the newly christened EssilorLuxottica commands a market capitalisation of about €50 billion (RM237.4 billion). Accelerating wage growth in advanced economies will also boost household spending this year. 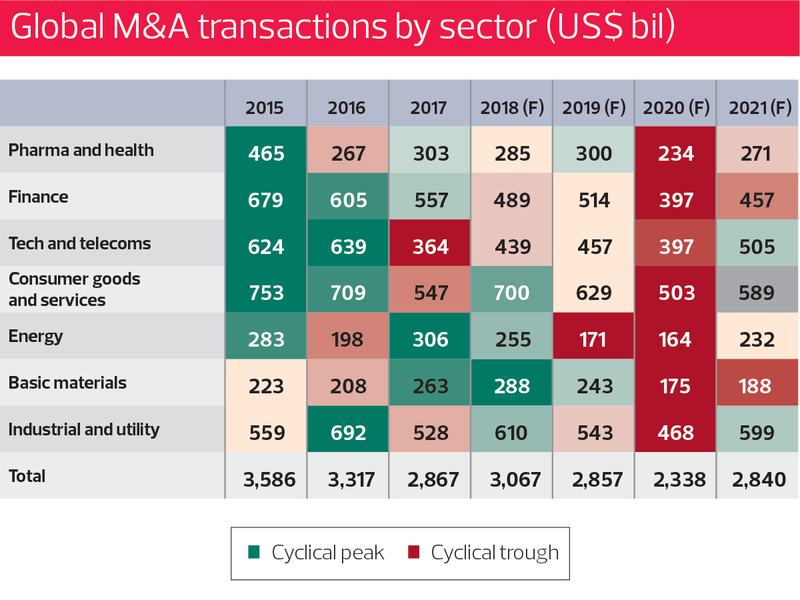 Although Baker McKenzie expects M&A activity in the consumer-facing sectors to cool off beyond 2019, it is likely to remain the largest deal sector by value. Technology and telecomunications saw accelerated activity last year, although the growth was more muted than anticipated, reflecting an increase in regulatory scrutiny. There were several major deals in the microchip sector that were blocked by regulators. In March last year, US President Donald Trump blocked chipmaker Broadcom Ltd’s takeover bid of Qualcomm Inc on the grounds of national security. This was done on the grounds that the merger would have given China an upper hand in mobile communications. Nevertheless, with some notable megadeals set for completion this year, Baker McKenzie expects another strong year in 2019 and the sector to continue to be an important one over the longer term. Moving into 2019, the report outlines several key risks that could dampen dealmaking and investor sentiment. The first is that the trade war will affect global growth. Trade tensions could continue to escalate, culminating in the US implementing a 25% tariff on all imports from China — and lower tariffs on other major Asian economies. Then, China could retaliate in kind. There is a risk that global GDP growth could slip to 2.4% this year, with damaging impact on cross-border deal flows. The second risk is a synchronised global slowdown. While business confidence and activity remain robust moving into 2019, cyclical factors such as rising interest rates, higher energy costs and falling spare labour could combine to trigger a sharper-than-expected slowdown over the next couple of years. Another risk is that inflation will surge, prompting faster-than-expected Fed tightening, which could trigger market turmoil. This could cause investors to reassess their expectations of US policy rates, resuting in a sharp market sell-off. Tighter monetary policies in the US and elsewhere in the world would sharply curtail dealmaking appetite. In the UK, the prospect of a “no-deal” Brexit — failure on the part of the UK and the EU to agree on an orderly exit — could substantially increase trade frictions and undermine business investment. This could cause the UK’s GDP to be 2% lower than the baseline by the end of 2020. The UK’s key European trading partners could also be affected, albeit less so than the UK itself, with knock-on effects on cross-border deals in particular.